Originally training at Mander college Bedford and received a city and guilds painting and decorating qualification SIR Decorator company has been established and working as a painter and decorator in Bedford for 25 years, helping local families, households and local businesses to build, renovate, and redesign their dream homes or commercial properties, through interior and exterior painting, wallpaper design and dust extraction, including maintenance services. As well as this, we have worked on Bedford-based commercial projects, enabling the town of Bedford to deliver high-quality services to the people of Bedford, directly working in and benefiting the community, whilst cementing experience gained in bigger, high-profile commercial projects in industry within this locality. This is seen on industrial projects we have worked on, to local authority and new construction sectors, working with contractors, in addition to domestic and commercial settings. We are a fully insured painter and decorator, providing workmanship you can rely on, whether in your home or on your high-profile business venture. Feel free to contact us for a free estimate, where we can advise you about your ideas and how we can bring them to life, so that your interior or exterior design in paintwork, or wallpapering can be realised with high-quality craftsmanship and skill that you can trust. Our paramount services to the interior of your home, business or commercial properties include; painting and decorating, wallpaper hanging and coving, artexing and patching. We keep your home or commercial property as clean as possible throughout our progress on the job and are mindful of keeping disturbance to yourselves, and neighbours equally minimal. What with our professionality, performance and productivity, it is no wonder that over 70% of our clients are referred by previous client’s recommending our services. This is why our aim is to provide amazing service to every client; and we want you to be happy to tell your friends and family just that. We use only the very best in materials and products to complete your dream look within your home or commercial property. When we have quoted your project, we arrange a start date and timescales to suit you, keeping you abreast of any variations on the project as they arise. As a quality service, we understand that clients have their own goals, deadlines and budgets for their project and we make it our business to work with you to achieve these. Building a relationship with our clients is paramount to us and this is why we always offer considered solutions to our clients’ differing needs. When interior wood is treated, the wood is sanded down to it’s base in a dust free environment. Any holes or other imperfections are filled and sanded smooth. Next is the undercoat and then the oil-based top coat paint. This is used for the top coat on wood such as doors, door-frames, skirting, cabinets and furniture. The wood is then brushed with fewer brush strokes, as this works better with oil-based paint. We rinse walls thoroughly and allow them to dry completely. If existing paint is peeling, we scrape back the area to remove the loose paint and then gently sand the surface. We fill any dents or nail holes in the walls with pre-mixed filler. Emulsion paint consists of tiny polymer particles, within which the pigments are trapped. These particles are suspended in water, then as the paint dries, the particles fuse together to create a film of paint on your wall. The walls of your home have the advantage of changing and transforming your space with the help of wallpaper. Dramatic rooms can instantly be made soft and airy with the application of light pale paint colour, whilst a room that feels too big can instantly feel cosier with darker wallpaper, to create a striking pattern. You may decide to fit coving to a room purely for decoration, or aesthetic reasons. However, you may use coving to cover up unsightly cracks around your wall and ceiling line. Whatever the reason, coving is described as being used to cover transitions between surfaces, and this is what gives it its horizontal decorative moulding. Coving can be made from several types of material, from lightweight polystyrene, paper faced plaster, plaster of Paris, wood, stone, concrete and even plastic. When coving is used for decorative purposes within your home, coving is normally made from lightweight polystyrene, paper faced plaster or plaster of Paris. These can vary in weight and cost respectively. Distinctive wallpaper hanging is essential and is where our eye for detail really comes in to play. We execute all wallpapering with patience and precision, affording great results time and again. Some people admire the variety in choice and style you can achieve with wallpapering, but are put off by the apparent ‘fussy’ application. However, that’s why we are here – to ensure you can still achieve the stylish, colorful and varied look of wallpapering – with perfect results, without feeling that it is harder to obtain. Wallpaper can add such a chic, modernistic touch to any interior, whether this interior is used as your workspace, your home, or to provide your own clients with a space they can enjoy. 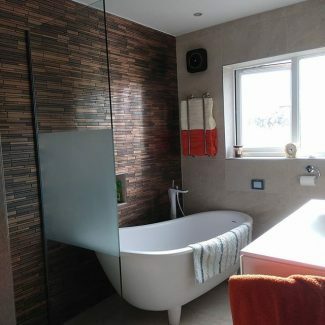 We include all types of wallpaper with our polished wallpaper hanging, which can include; contemporary, silk, textured, velvet, woodchip, bedroom, kitchen, bathroom, vinyl and repeat wallpaper – all designed to meet a variety of requirements and budgets for our clients. All our years of experience have lead us to where we are today, bringing to you the brilliant wallpaper hanging that you need for your new property design to flourish, leading to happy clients that spread the word. Our dust extraction involves optimum small-scale or industrial tool vacuums to ensure that your property meets HSI compliance in dust extraction. It is imperative that everyone should live and work in a healthy environment; whether at home, at work, or at leisure and this is where vacuum dust extraction is crucial for the safe enjoyment of your favourite places and buildings. At Spencer Rose painting and decorating, we are committed to ensuring your property is dust free, so that everybody can breathe fresh air! Dust problems can be obvious, but other times they are not – filling the air around us, unbeknownst to us, posing a greater health risk if left undetected. This is when effective dust management can make all the difference, preventing a dust problem becoming out of hand and stopping it from being a danger to peoples’ health. The UK’s Health and Safety executive have strict regulations in place to minimise the risk for people and can carry legal consequences for businesses that do not follow these. We work by these regulations and with businesses to ensure the best standards for individuals and their businesses. The main routes in which dust can be harmful are; dust penetrating the eyes and skin, as well as breathing in, swallowing or ingesting dust. Over the years, with the elements beating down on the exterior of your property, inevitably this will have led to wearing and erosion over time. Whether the; sun, rain, wind or snow, this can all contribute to a tired, old looking exterior, with discoloration and cracking. So when dealing with the exterior of your property, we will restore the materials of your building so that it stands proud; at its very best for all to admire. 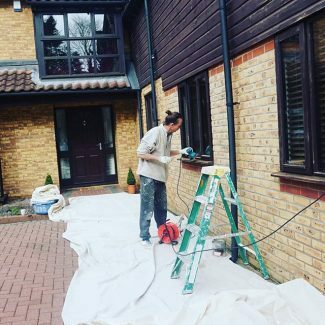 As part of the exterior services to your property, we include: exterior house painting and painting services, the painting of railings and fences, painting and decorating of exterior walls, painting and repairing of windows, rendering of the exterior of your property and scaffold hire for your painting and decorating project. When you work with Spencer Rose Painter and Decorator, you can relax, knowing that the exterior of your property is in the safe and trusted hands of professional tradesmen. The paint should be scraped off by hand using a paint scraping tool. Old paint may contain lead, and proper precautions are taken when removing those old fragments of paint. Wood that has been exposed to weather will eventually break down into a matte of dense fibers, that can be scraped loose with a fingernail. Before you can cover up this weathered wood with a coat of paint, the loose fibers must be removed. We start painting in the middle and work outwards, to avoid putting brush marks in paint that is starting to dry. On a window frame, that means starting on the wood thats closest to the glass. Once the undercoat is dry, we apply another coat on top. Two layers of undercoat should cover any darker paint finishes underneath and also helps to build a better base for the gloss coat. We allow the gloss to flow out over the surface as we paint, whilst also keeping an eye out for runs in the paint, to brush them out immediately. When brick walls are coated, outside wall finishes are used and are designed to be semi permanent. Sometimes bricks can benefit from a clear weatherproof wall covering, which will stabilise the surface and restore the bricks, without changing how they look. Ongoing maintenance of brick walls are required from the day you apply the last coat of paint. Once the last coat of paint has been applied to the outside your home, it is the first day paint degradation begins. Every house in Britain that has exterior paint applied to their home will see the effects of paint being broken down after their first winter. This is why ongoing maintenance is necessary and why eventually, this will need to be painted again. We cannot stress enough how important it is that any paint or coating that is applied to your exterior walls is a quality paint or wall coating system, which is also a breathable system, enabling your exterior walls to breathe through microporous technology. This then allows damp and moisture out, but not back in. We use a scrapers and sometimes wire brush to remove any loose rust and flaking paint. Abrasive paper can then be used to smooth out any rough areas. Metal surfaces should then be smooth to the touch and will need a primer to ‘key’ the surface. This will allow the topcoat to be applied evenly and smoothly. Whether for wrought iron, aluminum or other metals, there are particular techniques for painting different surfaces. The process of painting metals such as railings, columns, roof vents and decorative pieces like outdoor lamps is similar to painting wood. Some metals are galvanized and need pre-treatment in order for paint to stick to surfaces.